UK Prime Minister Theresa May is addressing the House of Commons after Britain and the EU agreed to a "flexible extension" of Brexit until 31 October. 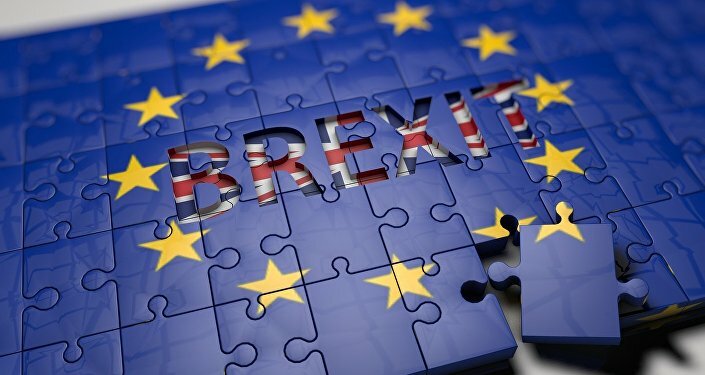 Radio Sputnik has discussed the latest developments concerning Brexit with Adam Garrie, a geopolitical analyst and director at Eurasia Future, based in the UK. Sputnik: What does the new six-month extension mean for the future of Brexit process? Adam Garrie: Before getting to that issue, there is something that because of my own conscience I must say. Julian Assange is now a political prisoner of regimes that have trampled on his human rights, they have tortured him. They have violated a clear order from the United Nations, which said: "he must be released, he is being held arbitrarily". And the entire world should condemn what is being done to him. Getting to the meat of your main question, the six-month extension is just an extension of an extension. It is kicking the can further down the road and it is difficult to foresee that unless there is a new general election within those six months that anything in the British Parliament will change. There is a deadlock on all sides. Prime Minister May's deal has been thrice rejected. And discussions between her and the leader of the opposition Jeremy Corbyn seem to be going nowhere. And that's before one remembers that a lot of members of her own party, the Conservative Party, think that the very fact she is even talking to Corbyn is somehow treason against her own party. So unless there is a new general election, this is just a stalling tactic and it is frankly an insult to the people who voted in the referendum no matter what side they voted on. Sputnik: How do you foresee the events unfolding now? What are the likely scenarios? Adam Garrie: Well, a lot of members of the Conservative Party are incredibly fed up of their own leader, Prime Minister Theresa May. They are looking at various options to remove her. Now, normally it wouldn't be that hard, you just need a quorum of what they call the 1922 Committee to vote her out. But the Tories now have this strange rule where they can only even try to vote out their own leader once every twelve months. They are looking at changing that rule actually to make it easier for them to politically defenestrate her, which would then trigger a leadership election within the party with people like Boris Johnson being widely touted as a possible replacement. But right now you have got a deadlock in Parliament, deadlock within the Conservative Party due to this obscure twelve-month rule. And because of that, an extension is frankly not only insulting but I can't see much else happening. The EU doesn't want to change the terms of their agreement. Theresa May doesn't really even want to try to. She still insists that her own "popular" deal is the best, where Parliament thinks it is the worst of all worlds. Some fairly reputable surveys from the last week show that a majority of the country, even more than the people who voted to leave in the first place, would be perfectly happy with a WTO rules style Brexit and then further free trade agreements with whoever Britain wants could then be formed. Sputnik: Do you think that this extension will give the British Parliament enough time to come up with an alternative to Mrs May's deal? And how likely is she to agree to a mandate? Adam Garrie: I just don't see it happening. Thus far the Parliament couldn't agree on any of the potential alternatives in this series of so-called indicative votes, which eventually just means advisory votes. And when Parliament is deadlocked, the standard solution in any parliamentary system in the world is to dissolve the parliament and hold fresh elections. That possibility is now looking incredibly more likely. Even though May doesn't want it, most Conservatives who want it but ironically most Conservatives do want a leadership election within their own party, which could at least galvanise a new government in a different direction if it was led by someone who supports Brexit, where, of course, Theresa May in 2016 openly supported remain. Sputnik: Which countries in the bloc would benefit and which would lose from Brexit the most? Adam Garrie: Well, it depends on what kind of Brexit we are talking about. Germany is the strongest economy in Europe by quite a ways but they export a lot of their goods, cause in particular to Britain. If tariff walls were erected against Germany, I have a feeling that the German government pushed by the German industry would hurry quite rapidly to try to get a simple, straightforward free trade agreement with Britain. In many ways that is the ideal solution rather than have incompetent politicians and most of them are quite an incompetent talk about theory. It would be much better if in practice people could see that WTO Brexit isn't going to end anyone's world but it would be mutually beneficial on both sides to have a simple free trading agreement with the EU like South Korea has, like Japan has, like Canada has — very simple and straightforward. They are making a mountain out of a molehill because of vested interests which are deeply tied into the political bureaucracy and the financial services bureaucracy in Frankfurt, the City of London, and Brussels. Sputnik: How likely is Britain able to start negotiating free trade deals in the near future? Are these deals possible in case of a no-deal Brexit? Adam Garrie: Well, they should have started negotiating these free trade deals the day after the Brexit vote. Just because you are in the European Union but are on your way out doesn't mean that you can't begin the negotiating process until the country is fully withdrawn. They should have done this straight away. Instead of trying to beg the EU for some sort of weird parasitic relationship, they should have said to all sides: "look, we are going to go to China and talk free trade. We are going to go to the US and talk free trade. Yes, we are going to go to Brussels but not for a new treaty, not some sort of Customs Union agreement, but for a free trade agreement". And these are just some of the countries and entities where Britain could and should have a free trade agreement. So they managed the process totally wrong from the word go. They should have prioritised free trade agreements as many as possible with as many countries as possible beginning the day after Brexit nothing more, nothing less. Sputnik: The United Kingdom must now hold European elections in May or leave on the 1st of June without a deal. How do you think the situation will develop? Adam Garrie: Well, it looks increasingly likely that there will be European elections and that is going to be bad news for the British government. It is going to frankly be bad news for the British opposition. It is going to be very bad news for the European Union because the kind of candidates that are going to, I sweep those elections, are going to be hardline eurosceptics from both the right and the left. This will represent a big bloody nose to the establishment in the UK. And it will represent British members of the European Parliament coming in with a clear obstructionist mandate. That frankly scares the hell out of both London's elite and Brussels' elite. And weirdly, it is one of the few areas encouraging all sides to come up with some solution prior to the beginning of June because neither side actually wants Britain to participate in these elections. But unless something changes in the next couple of weeks, it seems inevitable that Britain will be participating. Views and opinions, expressed in the article are those of Adam Garrie and do not necessarily reflect those of Sputnik.